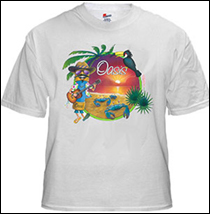 We have received a number of emails from customers looking for Oasis® T-Shirts, so I thought it might be fun to see if a graphic designer could come up with something funky and fun to wear. The shirts are high quality Gildan Ultra Cotton and come in sizes small, medium, large, XL and XXL. Small thru XL were $15. Now Just $10!